The return of the BMW X3, delivered by Thaco at a cheaper price of about 150 million, is threatening the Mercedes-Benz GLC, which will hit record sales of nearly 2,500 units in 2017. On the market, the BMW X3 and Mercedes-Benz GLC are two long-standing rivals. The return of X3 at a more attractive price will certainly create a fierce competition in the market in the first quarter of 2018. BMW X3 and Mercedes-Benz GLC, uncompromising fight? Known as the pioneer in the luxury segment of small SUVs, pulling the big Mercedes, Audi or Land Rover entered the game. BMW X3 officially launched at the Detroit Auto Show 2003 and present in Vietnam in 2011. Lasting until August 2014, this car continues to have upgraded version with 3 options: X3 xDrive20i, xDrive28i and xDrive 20d. On the rival side, Mercedes-Benz GLC launches to Vietnamese consumers in June 2015 with the task of successor "senior" GLK. Less than a year later, Vietnam became the first market to build a GLC outside Germany. 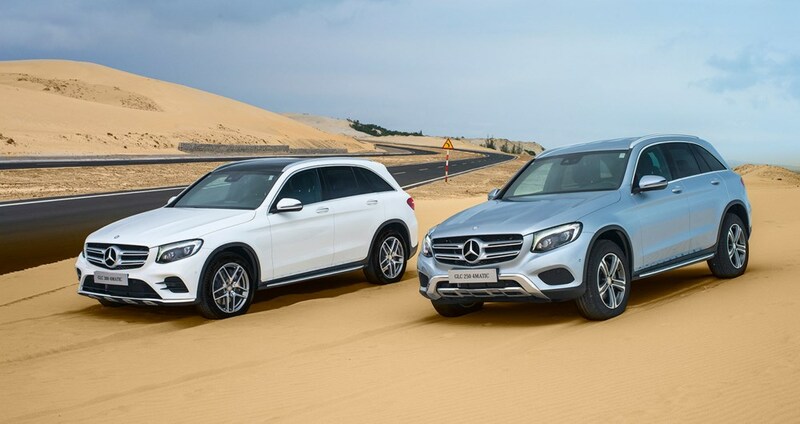 Both the GLC250 and the GLC 300 bring in the strengths of the previous generation, and many new innovations are expected to create new craze in the market. 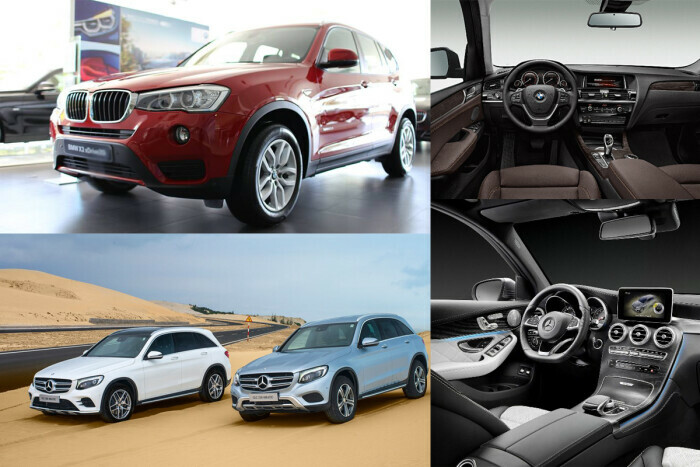 In this comparison, we dissected the two most advanced versions of the company are BMW X3 xDrive28i and GLC300. In terms of design, the GLC carries on its sturdy lines, highlighting the strong embossed lines. The strength of the GLC is that it is equipped with LED headlamps while X3 rivals are equipped with projector lights. However, the biggest drawback of the Mercedes-Benz GLC is the lack of fog lights, a small but useful details when moving in the night or fog in winter. On the overall dimensions of the car, the BMW X3 outperforms the GLC by more than 1 mm in length and 34 mm in height. Specifically, the GLC has a long, wide, high in turn: 4,656 x 1,890 x 1,644 (mm) and a base length of 2873 mm. Overall dimensions of the BMW X3 are 4.657 x 1.881 x 1.678 (mm) long, wide and high, and 2.810 mm long. On the ability to operate, the common point of both opponents is using the I4 2.0 supercharged engine, giving the same capacity of 245 horsepower, but the maximum torque on the GLC is up to 20 Nm stronger. Specifically, the GLC 300 uses supercharged I4 2.0 engine, with a capacity of 245 horsepower and maximum torque of 370 Nm. The 9G-TRONIC 9G Automatic Transmission, along with the 4MATIC 4-Wheel All-Wheel Drive, is included. The BMW X3 xDrive28i is a supercharged 2.0 liter supercharged I4 2.0 engine, with a top speed of 245 hp, maximum torque of 350 Nm, plus an 8-speed automatic transmission and full-time four-wheel drive. If the Mercedes-Benz GLC is associated with the styling of the "three-pointed star" brand, the BMW X3 is geared towards dynamism and convenience, meeting the needs of urban and home-grown people alike. stable operation, spacious cabin space and many facilities. 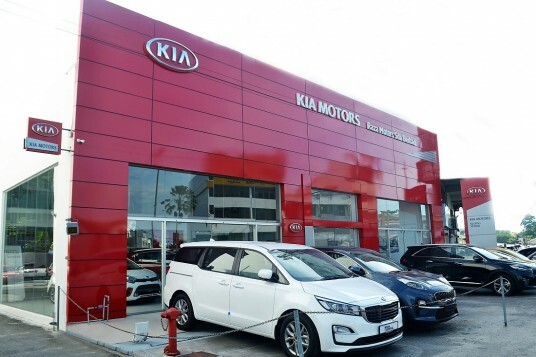 Thus, with a range of about 2 billion VND, consumers can choose a better imported car than a locally assembled car.